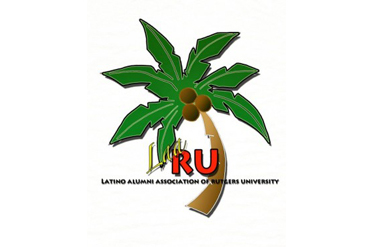 The mission of the Latino Alumni Association of Rutgers University (LAARU) is to serve as a voice for the Latino community, provide educational, vocational, and mentoring partnerships. We will foster cultural awareness and networking opportunities to undergraduate, graduate and alumni of Rutgers University. LAARU is a registered chartered alumni organization under the Rutgers University Alumni Association (RUAA) and operates as an independent alumni group. We partner with the Center for Latino Arts and Culture through a Memorandum of Understanding to better serve our community. In 2010, LAARU established it’s award winning Mentoring Program where active alumni get paired with undergraduate students either in their major or industry of interest. 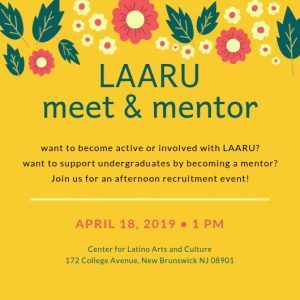 To learn more information on how you can become involved with LAARU in general or through the mentoring program please fill out the mentor/mentee online application form. If you would like to become a general member please submit this application. Departments, Corporations and Not-for Profits interested in partnering with LAARU as a co-sponsor should fill out this form. Co-Sponsorship includes (but not limited) covering costs related to supplies, food (etc) for a LAARU related event. This partnership will enhance co-sponsor’s visibility and highlight services that target the population we serve.